Drivers often think of their winter tires as a different breed from their summer and all-season tires, not just with different treads and rubber compounds, but also different rules about how to maintain them. One of the questions we’re often asked is Do you need to rotate winter tires? The short answer is, Yes. Just like your summer tires, you want to make sure your winter tires wear evenly. When it comes to rotations, the same rules apply to both types of tires. The reason why we rotate tires—summer or winter—is to promote even wear and extend tire life as well as improve performance. Tires with good tread depth and even wear offer better handling and steering response. Tires need to be rotated because the front tires on most vehicles experience a lot more stress. More weight. More cornering forces. More wear. So, by swapping them to the back (and we’ll get to rotation patterns in a moment) at regular intervals, you’re giving all your tires a chance to wear at the same rate. If your vehicle is an all-wheel drive (AWD), your tires are even more likely to wear a bit faster in the front. Also, sensors that monitor new AWD vehicles can be very sensitive, so if you’ve got severely worn tires on the back, the sensors and the drive components are going to work overtime. Rear wheel drive vehicles exert a bit more force on the back tires, so you’ll see accelerated wear on the back as well as the front with that type of system. This is also just like their warm weather counterparts: Winter tires should be rotated approximately every 8-10,000 kilometres, or the recommended length of the tire manufacturer. For most of us, who tend to stick a little closer to home in the winter months, you can probably get away with once a year—rotating at the start of each winter season when you have your tires changed over. Rotations are also a good chance for your service team to catch any issues with alignments, more common in winter as our vehicles battle potholes, snow-hidden curbs and more. Sometimes slight misalignments aren’t felt at the steering wheel, but they often show up as uneven wear on tires, and it’s best to take care of any suspension issues early on. Depending on your vehicle’s drive system, and your tires, rotations will follow one of a handful of patterns. Often, though, winter tires are what we call ‘uni-directional’ or ‘directional.’ That means the tread pattern is designed to roll only in one direction. Uni-directional tires can only be rotated front to back. (To learn more, read our post What’s the Difference Between Directional, Asymmetrical and Symmetrical Tread Patterns?) Studded tires also tend to follow the front-to-back rotation pattern. Looking for other ways to stretch your tire budget and keep them performing at their best? Read our post 5 Ways to Make Your Tires Last Longer. 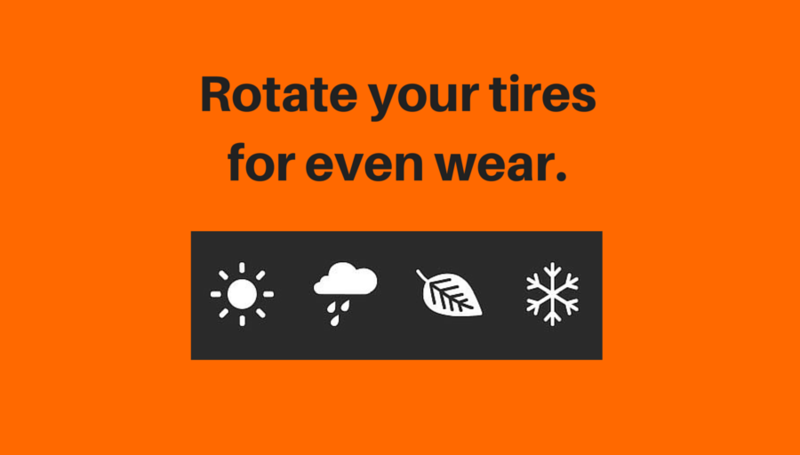 When it’s time to rotate your winter tires, visit the tire experts at Kal. Stop by one of our Kal Tire locations near you!